The US Economy: A Good Future? + We have an energy bonanza fueled by hydraulic shale fracturing (“fracking”) which will continue for decades. This has provided an abundant low-cost energy resource. There is a wide gap between the price of natural gas compared to the price of oil. Gas prices are 4xs more expensive in Europe and 5xs more expensive in China than they are in the US. This provides low cost energy to fuel our economy. Natural gas provides some cleaner environmental benefits compared to other hydrocarbons. Fracking is also friendlier to the environment than traditional drilling as there are less holes drilled in the ground. An interesting aside is the only place in the world where there is not the presence of shale gas is in the Middle East. + The US has the world’s most innovative and productive economy. We have the highest gap between what industrial workers are paid ($600B) and industrial production ($2.4T) of any country in the world. We are still the place of great innovation and new ideas that fuel new industries. + The US banking and credit union system has been largely repaired and is well-capitalized. There is a slow renewed growth in lending. + There is a slowly accelerating business formation and job growth, but this is primarily in several areas or regions of the economy, as opposed to being all across the country. + The housing market appears to have bottomed in many areas and is moving up. + The US has decent private-sector growth and has some government shrinkage, especially at the state and local level. - There is a lot of uncertainty in a “fiscal cliff” deal and how that will actually impact the economy. We need a strong and stable plan to work through the issues now and not just push this into the future. If a decent deal is done, the economy could surprise to the upside. - The US has a large growth of entitlement spending with a record number of people on food stamps, unemployment compensation, Social Security Disability, and now healthcare. We simply can’t afford this. - There is an uncertainty in the private sector, with a tsunami of government rules and regulations. This is increasing the cost of doing business and will lessen productivity. It will also force some companies to cut back or close altogether. - By far, the largest threat to the US economy is the large amount of domestic debt we have in our country. This is at a level that we have never been at in the history of our country. Highly encumbered households do not spend. Governments at all levels will cut back. Companies lack the top line growth and don’t expand capacity, and political games will paralyze decision making. This will hamper growth for years to come. Take a look at the chart below. This measures total debt in our economy as a percent of GDP. Note the drop that shows up around 2009. This is not from retiring debt. It is from mortgage defaults and the reduction of debt that came from foreclosures. One thing to note is that we have had huge debt bubbles in the past. 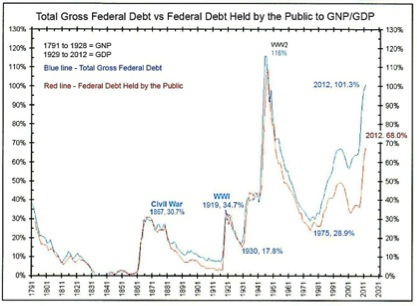 Note the following chart that has tracked Federal Debt since 1791. Note that the federal debt from WWII was higher than it is today. One difference today is that a greater percentage of Federal Debt is not held by the public. How did we drop from the high after WWII to a low of 28.9% in 1975? Did the government pay off that debt? The next chart shows the key. See, there is no way to pay down the debt without inflating the currency and retiring a fixed amount of debt with inflated dollars. Note this happened after WWII with an inflation rate that reached 20%. It is possible, but I don’t think that we will have that high of inflation. If the inflation rate rises to 4-5% per year over a 10 year period, you will get rid of the majority of the debt if you are not incurring new trillion dollar deficits each year. So the take away here is to expect higher inflation in the future. Tagged: Economy MBS "Phil Love" "US"
Older PostThe Eurozone: What Impact Will It Have on the US?